Hohoho! Light up the Christmas spirit by joining the legendary Lady in Red. 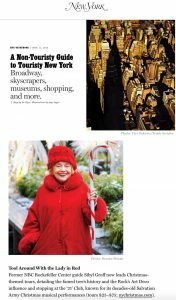 Carrying a candy cane and dressed like a Christmas tree, The New York Times reports that this “elf’s tours are whimsical and informative, part personality , part history.” The Lady In Red continues to study all aspects of Christmas and is the author of A New York Christmas — Hohoho at Gothamtide. (visit Amazon for this 5 star rated book). Topics include the history and the multi-faceted importance of of the Rockefeller Center Christmas trees, decorations, festivities together with learning about the importance of Rockefeller Center, the most important urban complex of the 20th century made for commerce but created with art. 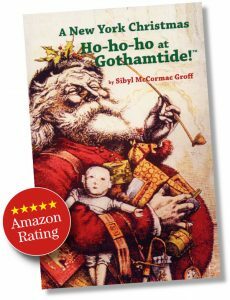 Be dazzled about the role of New York’s commercial stores, the printed word, the family, charity and transportation in making Christmas the most popular holiday by the end of the 19th Century. You will be electrified by the lights not only at Rock Center but also the vibrant sound and light show across the street at Saks Fifth Avenue and on Fifth Avenue. To many, Rockefeller Center is the Christmas Capital, so the merrymakers are dense and intense. Tours are limited to 15 people. In addition to touring Rockefeller Center, guests stroll up Fifth Avenue and through adjacent streets looking at the magical stores, hotel decorations and illuminations. Caroling might be heard. Private Tours: Contact Sibyl for more information. 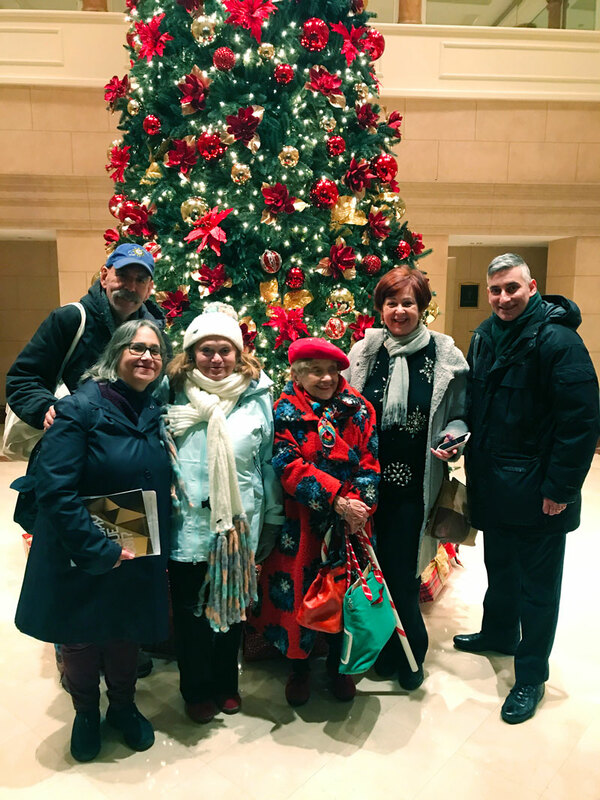 Christmas & Holiday 2018 Light up your holiday season with a Christmas walking tour of Park Avenue, Fifth Avenue, and Rockefeller Center.